Growing demand for cheaper and environmental-friendly fuels for power generation other than diesel and petrol is the key factor which is driving the growth of gas fuel based gensets in Indonesia. However, political instability, falling electricity prices and limited connectivity of gas pipeline network in Papua, Kalimantan and Sulawesi island are acting as the major restraints for the high speed gas genset market. 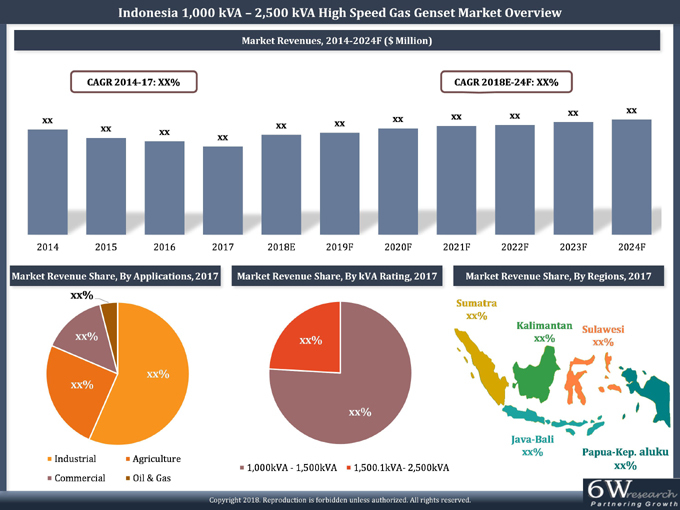 According to 6Wresearch, Indonesia 1,000 kVA - 2,500 kVA High Speed Gas Genset Market is projected to grow at a CAGR of 2.4% during 2018-24. 1,000 kVA - 2,500 kVA High speed gas gensets are mainly used as an auxiliary power source in various medium and large scale industries and manufacturing units. Further, rising FDI investment and strengthening of macro-economic factors would lead to an increase in the number of new industrial units in the country over the coming years, which would drive the market to sustain a steady growth during the forecast period. On account of a better gas pipeline distribution network in Jakarta, Bandung, Central and West Java, 1,000 kVA - 2,500 kVA high speed gas gensets registered highest market growth in past few years. Additionally, increasing FDI and DDI investments in major cities of Indonesia, including Jakarta, Bali and Bandung, would lead to several new industrial opportunities in the country and result in increase in demand for 1,000 kVA - 2,500 kVA high speed gas gensets in these regions. The report comprehensively covers the Indonesia 1,000 kVA - 2,500 kVA High Speed Gas Genset Market by kVA rating, applications and regions. The report provides an unbiased and detailed analysis of the on-going trends, opportunities, high growth areas and market drivers which would help the stakeholders to device and align their market strategies according to the current and future market dynamics. • Market Size & Forecast of Indonesia 1,000 kVA - 2,500 kVA High Speed Gas Genset Market Revenues until 2024.
by KVA Rating for the Period 2014-2017. Market Revenues by KVA Rating until 2024. Revenues by Applications for the Period 2014-2017. Market Revenues by Applications until 2024. Revenues by Regions for the Period 2014-2017. Market Revenues by Regions until 2024. 13.1 Mitsubishi Heavy Industries Engine System Asia Pacific Ltd.
13.4 FG Wilson Asia Pte Ltd.
13.8 Deutz Asia-pacific (Pte.) Ltd.